You can offer several shipping options in your website store so your customers can choose from a range of delivery speeds and costs at checkout page. We do not have any mechanism to calculate shipping automatically, so you’ll need to setup these costs manually. Now, let’s suppose you want to ship Tshirts worldwide and Art Frames will be shipped only to USA and Canada. Also, we want to consider that shipping two Tshirts together doesn’t double the shipping cost – it just increases the shipping cost by a fraction, whereas shipping two art frames together does double the shipping cost. Shipping rate for one tshirt and for each additional tshirt. Shipping rate for one art frame and for each additional art frames. Once you have created the shipping lists, you can then assign them to respective products easily. Click here to see how. Countries – Select the country to which the product will be shipped – your base country is the first place to start with. 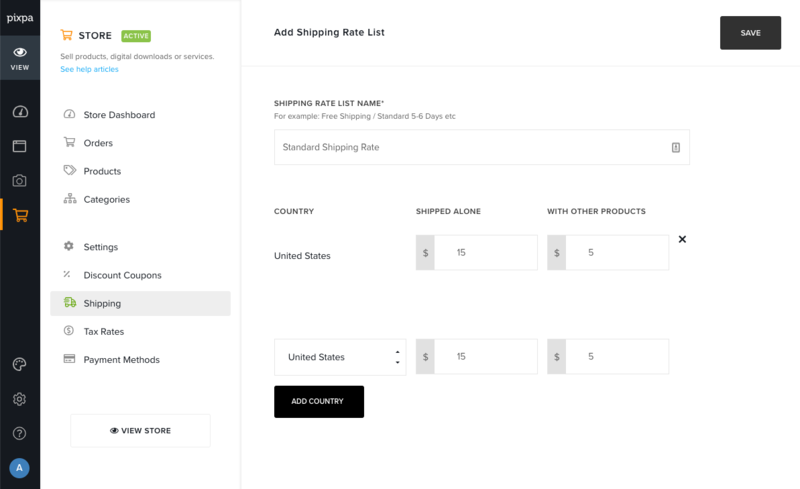 And select Everywhere else from the dropdown if you want to ship worldwide and want to assign a flat rate for all remaining countries that are not included yet. Shipped alone – If a customer buys a single product, the shipping rate specified for the shipped alone is applied. And if there is more than one product in the order (of different shipping list), the highest “shipped alone” cost in the order is applied. With other products – This is the additional cost for each other product in the order. If the customer buys three items of the same product – the Shipped alone shipping rate is applied for the first product and the with other products shipping rate is applied for the other two products. You can also enter $0 (zero) for flat-rate shipping. Click here to see how to create a shipping list in store. For example: you create a shipping list for US where you sell an art frame for $10 shipped alone and $4 with others, and a mug for $8 shipped alone and $3 with others. Someone orders two art frames and one mug, so they’d be charged $10 + $4 + $8 for a total of $22 shipping.